After a scare with her 15-month-old baby girl Chloe, mother of two, Danielle Kapetanovic, is warning other parents via social media about the dangers of Baby Orajel. While Danielle later learned that the FDA warns against giving babies the active ingredient in this seeming harmless teething treatment — like many, she was unaware of the extreme risk it posed until her daughter lie limp and blue before her. Seeing her baby at the brink of death propelled her to share her experience (as well as the similar experiences of others) on Facebook in order to warn other parents who also may be in the dark about this potentially deadly baby product. Chloe is 15 months and teething. Someone I know recommended trying Baby Orajel on her gums to alleviate some of her discomfort. I bought the nighttime version as seen in the picture and right before her bedtime decided to apply it. The directions say apply a “pea size” – I put less than a pea size on my finger and applied it to her gums. Chloe immediately turned red, started kicking, got one or two screams in, and 10-15 seconds after the Orajel touched her gums she became unresponsive. Her eyes locked in a dead stare, she became limp and stopped breathing. She turned blue. I grabbed her and put her against my body, hitting her back trying to wake her up, but no response. I ran her down the hall to my bed and lied her down and began breathing into her mouth as Mike called 911. Thankfully she woke up and started screaming and crying after maybe 15-20 seconds in total, which felt like an eternity. The ambulance arrived and EMT’s checked her out and determined she was okay. Unfortunately, I did not know this in advance, but there are many other parents out there who have experienced the exact same occurrence with their own children when using Baby Orajel. I found online posts dating back to 2008 from parents with literally the same experience – their baby became unresponsive in seconds, went limp, turned blue, became responsive again after 15 seconds or so – it was like someone wrote my same experience. 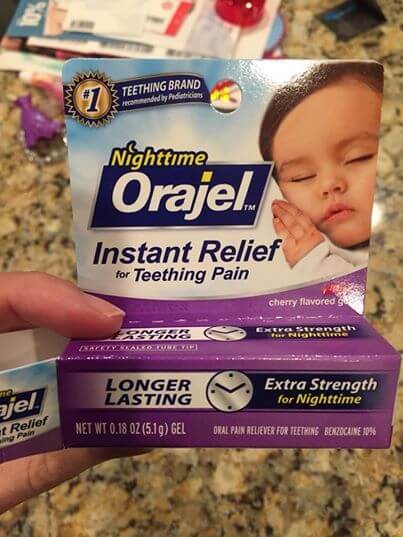 What’s more, I learned the FDA warns against giving babies Benzocaine – the active ingredient in Baby Orajel. The use of benzocaine gels and liquids for mouth and gum pain can lead to a rare but serious—and sometimes fatal—condition called methemoglobinemia, a disorder in which the amount of oxygen carried through the blood stream is greatly reduced. Children under 2 years of age are of particular risk, with almost 80% of reported benzocaine gel related cases of methemoglobinemia having occurred in children under 2. Chloe has since been checked out by her pediatrician and they think she will be just fine. Unfortunately her Doctors can’t definitively say if what happened to Chloe was a reaction to the benzocaine in the Baby Orajel vs a “breath holding spell,” or something else.